A holographic 3D display with 300 mm×200 mm active area was built. The display includes a spatial light modulator that modulates amplitude and phase of light and thus enables holographic reconstruction with high efficiency. Furthermore, holographic optical elements in photopolymer films and laser light sources are used. The requirements on these optical components are discussed. Photographs taken at the display demonstrate that a 3D scene is reconstructed in depth, thus enabling selective accommodation of the observer’s eye lenses and natural depth perception. The results demonstrate the advantages of SeeReal’s holographic 3D display solution. P. St.-Hilaire, S. A. Benton, M. Lucente, J. D. Sutter, and W. J. Plesniak, “Advances in holographic video,” Proc. SPIE 1914, 188–196 (1993). C. Slinger, C. Cameron, S. Coomber, R. Miller, D. Payne, A. Smith, M. Smith, M. Stanley, and P. Watson, “Recent developments in computer-generated holography: toward a practical electroholography system for interactive 3D visualization,” Proc. SPIE 5290, 27–41 (2004). Y. Takaki and M. Nakaoka, “Scalable screen-size enlargement by multi-channel viewing-zone scanning holography,” Opt. Express 24, 18772–18781 (2016). R. Häussler, S. Reichelt, N. Leister, E. Zschau, R. Missbach, and A. Schwerdtner, “Large real-time holographic displays: from prototypes to a consumer product,” Proc. SPIE 7237, 72370S (2009). S. Reichelt, R. Häussler, G. Fütterer, and N. Leister, “Depth cues in human visual perception and their realization in 3D displays,” Proc. SPIE 7690, 76900B (2010). A. Kogelnik, “Coupled wave theory for thick hologram gratings,” Bell Syst. Tech. J. 48, 2909–2947 (1969). D. Jurbergs, F.-K. Bruder, F. Deuber, T. Fäcke, R. Hagen, D. Hönel, T. Rölle, M.-S. Weiser, and A. Volkov, “New recording materials for the holographic industry,” Proc. SPIE 7233, 72330K (2009). J. Someya, Y. Inoue, H. Yoshii, M. Kuwata, S. Kagawa, T. Sasagawa, A. Michimori, H. Kaneko, and H. Sugiura, “Laser TV: ultra-wide gamut for a new extended color-space standard, xvYCC,” in SID 06 Digest (2006), pp. 1134–1137. S. Reichelt and N. Leister, “Computational hologram synthesis and representation on spatial light modulators for real-time 3D holographic imaging,” J. Phys. Conf. Ser. 415, 012038 (2013). R. Tudela, E. Martin-Badosa, I. Labastida, S. Vallmitjana, and A. Carnicer, “Wavefront reconstruction by adding modulation capabilities of two liquid crystal devices,” Opt. Eng. 43, 2650–2657 (2004). 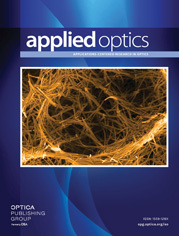 P. Yeh and C. Gu, Optics of Liquid Crystal Displays (Wiley, 2010). E. Zschau and S. Reichelt, “Head- and eye-tracking solutions for autostereoscopic and holographic 3D displays,” in Handbook of Visual Display Technology, J. Chen, W. Cranton, and M. Fihn, eds. (Springer, 2012), pp. 1875–1897. E. Zschau, R. Missbach, A. Schwerdtner, and H. Stolle, “Generation, encoding and presentation of content on holographic displays in real time,” Proc. SPIE 7690, 76900E (2010). Fig. 1. Schematic principle of SeeReal’s holographic 3D display. Light source, FL, SLM, SHs, and VW are shown. The 3D scene can be located anywhere in the yellow area and is visible from the VW that is positioned at the eye pupil. Fig. 2. Concept of beam expansion in VG (left) and concept of cFL (right). Fig. 3. Drawing of the BLU. The light after the fiber output is collimated by a collimating lens and twice expanded in VG stacks. Fig. 4. Experimental setup of BLU with area 300 mm×220 mm. The light after the fiber output is collimated by a collimating lens and twice expanded in VG stacks. Fig. 5. Absolute DE for a stack of RGB VGs for the BLU. The DE versus incidence angle is shown for wavelengths 640, 532, and 473 nm. The VGs were measured in the reverse direction, i.e., at normal input and slanted output. Fig. 6. Photographs of pixels of the SLM during alignment. The left photograph shows vertical misalignment of the order of 10 μm, visible as a black shadow at the bottom of the pixel apertures. The right photograph shows perfect alignment. Fig. 7. Schematic drawing of the holographic display. The target configuration (left) includes the BLU, SLM, and cFL. The temporary configuration (right) uses a point light source (LS) and a collimating lens (CL) to generate collimated light at the SLM. Fig. 8. Photograph of the holographic display. The aperture in the front surface is the active area with a diagonal of 350 mm. Fig. 9. Photographs of reconstructed holographic 3D scenes. The CGH is the same for all photographs. The camera lens focus was set on distances 0.65 m (top), 1.2 m (center), and 1.7 m (bottom) from the VW.